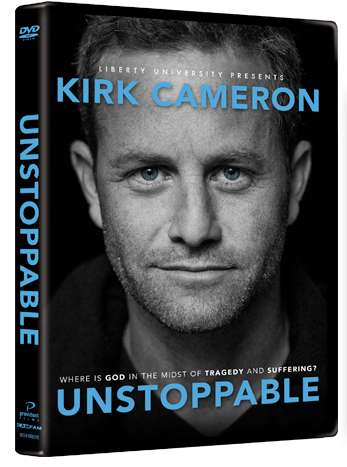 While I sat back and watched Kirk Cameron's UNSTOPPABLE I felt like he could listen to my thoughts. I have dealt with death a few more times in my life than I would like and I have never understood.. Why? I've never understand the question, "If there is a God, Where is he in the midst of tragedy and suffering?" The movie starts with a story of a young man named Matt, who has taken his last breath and lost his fight with cancer. Quickly you shift and follow Kirk Cameron through the story of the beginning of the earth. As he takes you through many of the stories in the Bible, he'll bring you back to learning about Matt and his family as they go through his burial. All along the way, Kirk Cameron shows you why his faith is strong in God and why he can keep that faith. There are are a few scenes in this movie that I shielded my daughter's eyes from as they are a little graphic, but follow the stories as they are told in the Bible. If your children are not familiar with the death and tragedy inside the Bible, I would recommend not letting them watch with you. Sweet Cheeks and Savings has been given a chance to give one of you lucky readers a copy of this movie! Enter the giveaway below! Dates: Starts February 3, 2014 4:00 pm EST. Winner will be chosen February 12, 2014 11:59 pm EST. Growing Pains :) Loved that show! I too remember him from Growing Pains. He was a cute kid, but he has grown into a very nice looking man. I've heard a lot about this movie from reviewers, and am curious enough about it to watch it myself. Great review! I used to love him when he was on Growing pains....then he just sort of dropped off the face of the earth. I had no idea he was doing a new project! Oh yes, I've heard about this one! He actually has a few great films out right now! But I'm glad you liked this one - I need to get it. His faith is really quite inspiring. I'm glad he has a new project out for his many fans. I have not heard of this but from reading this here i would be interested in watching it. Sounds like a very healing movie. I do remember him from Growing Pains. He is a great actor. I recall him from Growing Pains. I want to see this movie. I believe he was on Growing Pains. That face looks very familiar. I have not heard of this movie but it is probably heart wrenching. Yes, I remember Growing Pains and yes, he is all grown up now! Sounds like a book I would love to read. Wish I could enter the giveaway. Thanks for the review! I haven't heard much of him since Growing Pains either; this project is all new to me. I remember him from when he was on Growing Pains many years ago, but I have heard quite a bit about his faith in recent years. I'd love to watch this DVD. He was so awesome on Growing Pains. Good to see him again! My mother loves this movie, I have never seen it and need to. I would love to win this for her. I've not heard of this movie but after your review, I'm willing to watch it! I can say i've heard of the movie. Looks like one the hubby would enjoy. This movie looks like one both my husband and I would enjoy! It sounds like a really great movie! I use to love him back in the day, I will have to check this out, thanks! Sounds like an interesting movie. I remember Kirk Cameron from Growing Pains. He was such a cutie back then. Oh wow, I remember Kirk from Growing Pains! Doesn't his sister Candace own a television station & direct movies now? My mother loves Kirk's work & she would love this DVD! Wow, I haven't seen Kirk Cameron in years. He looks so much older. It's great that he is working again. I remeber him from Growing Pains and some of his Christian Movies.